After three or four eager beavers had shared, I cast my eye across the group and asked a sudden question: “Are any of you guys American? Will any of you be celebrating Thanksgiving?” They only looked at each other for half a second. “Wait! First of all let me finish. Second, raise your hand please. Is it where you’re born, where you’ve lived most of your life, or where your parents are from?” This time the ones who had shouted out an answer reigned in their enthusiasm and put it in their bodies. One or two of them flapped their hands high in the air at me; another stood up, his body as straight as his raised hand; three or four of them added wide eyes and small squeals to their straight arms. 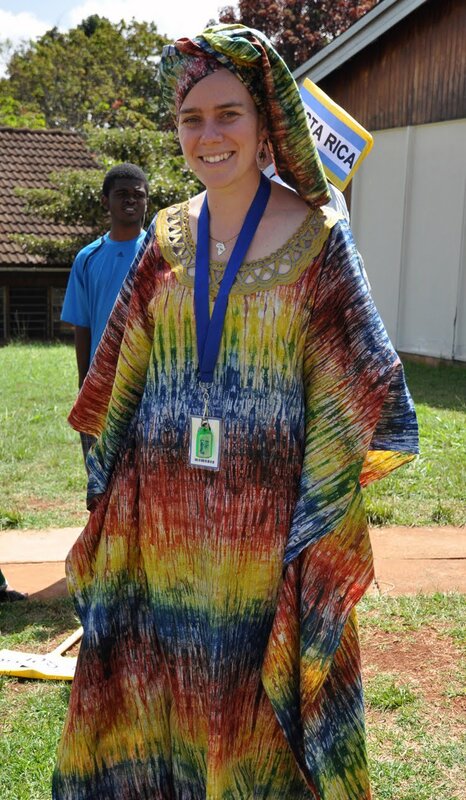 Last Friday we had International Day at school. All 800 kids and faculty got to dress up and represent their “home country” in a short parade. The parade was followed by a food fair – a feast of fare from every continent. For the last two years, I’ve gone as an American. Why not really? It’s an excuse to wear jeans to school. I don’t have to justify my American-ness to anyone. It’s almost never questioned – at least not by onlookers in a parade, and rarely by students. This year though, I decided to embrace a less visible side of me. I decided to dress fully West-African. I donned a colourful embroidered boubou with matching head wrap, wore heels and gold jewelry. Need proof? A mental picture? “Zimbabwe.” She laughed a little, knowing I had her. 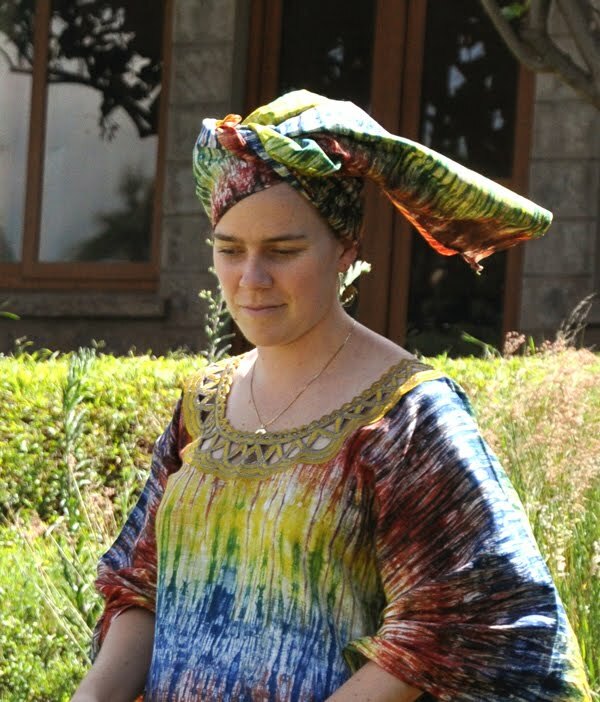 She had on a pale yellow sundress and a light-blue short-sleeve sweater top – not especially Zimbabwean. “There’s yellow in the flag!” she exclaimed, trying to defend herself against my skeptical look. But not blue, I thought. If anything she could be walking with Sweden. “So an African can dress American but an American can’t dress African?” I asked. “No!” she laughed. The friend walking with her shot her a strange look – like, why would you say that to a teacher?! kind of look. “It’s Ms. Lillis! It’s okay.” And it was. Because it got me thinking. Right now there is an Indian wedding party happening in the community centre behind my apartment complex. The view from my kitchen window is a swirl of bright saris whirling in time to the beat of the tablas and singers. I’ve never been to India. My knowledge of the culture is limited to the books I’ve read, movies I’ve watched, friends I’ve had, and food I’ve eaten. A well chosen sari and some carefully rehearsed dance moves might get me into the party, but they would not make me Indian. What would? Living there? Many of these revelers haven’t. If I had to venture a guess, most of the guests this evening are probably second or third generation Kenyan residents. Many have never lived in India and some would say they are Kenyan. What I see is a dualism of “from-ness.” There is the commonly held belief that one must be “from” a specific place. The answer to the question must come from one of the three options I gave my fifth graders earlier today: birth place, life experience, or familial connections. It ought to be singular and definite. However, this singular view of “from-ness” is often undermined by the reality that many people experience – the reality of an unfolding and shifting identity. The sense of having been “from” more than one place, or of having significant life connections with more than one cultural / community group. I am beginning to believe that identity is NOT a birth place, or a passport color, or a parental bequest. I think identity is a story. And as such, it may be all three. Each story is as unique as the one living it, and unfolds with each day, each choice, each experience. Those are a few of my thoughts. I will probably edit this and add to it as I continue to ruminate, but for now, that will do. Please share if you have any thoughts to add. Love that I know what class you had and can identify most of the kids by their answers. Brooklyn. Gotta love it. love this post, lillis. i was thinking, when people in the U.S. ask me where i'm from, 50% of the time the right answer is “Chicago,” and the other 50% of the time the right answer is “the Philippines!” by the way, you looked great on international day.